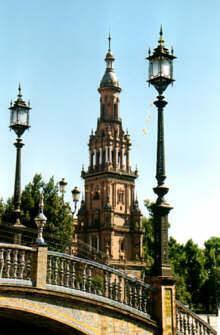 At the Plaza de España in the Maria Luisa Park, you will find a very picturesque palace. 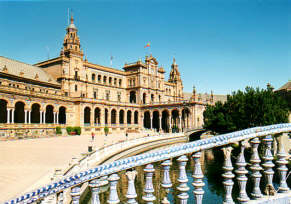 This palace, and a lot of other buildings in this park, were constructed for the Ibero-American Exposition of 1929. It is amazing to hear construction for an exposition in 1929 started as early as 1914. It is so amazing, we just don't believe it. And yet, it appears to be true. In 1914, the Spanish architect Aníbal Gonzalez started with the construction works for the exhibition. 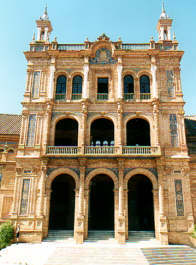 The palace at the Plaza de España was used as the office of the fair. Today, the buildings house city government offices. 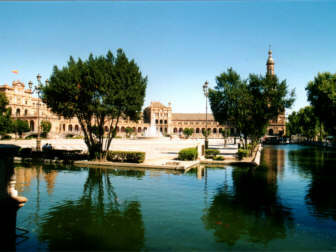 You may have seen photographs of the Plaza de España before. 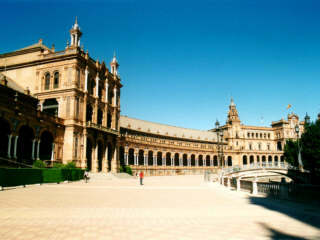 Every photographer who happens to visit Sevilla, wants to make some photos of the wonderful looking building. 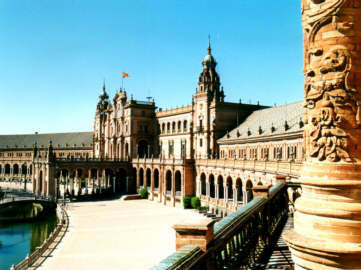 It's also possible you've seen the Plaza de España somewhere else. If you've seen Star Wars II - The Attack of the Clones, you might have seen it. One of the scenes of this movie was shot between the columns of the palace. In a science fiction movie like Star Wars, the Plaza de España looks like it really belongs in the 34th Century. This aspect of the palace is a lot of fun. Spain has many provinces. Today there are 47 on the mainland, 2 on the Canary Islands, and 1 for the Baleares. On the front of the palace, every province has a mosaic. On the picture on the right you see the one for León. Stupid enough, we forgot to count the number of mosaics. As we recall, we don't remember seeing the Canaries or the Baleares. 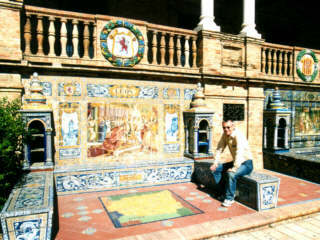 Many Spaniard have their photo taken here, in front of the mosaic for their home town (or the one they were born). If you're not from Spain, you might be lucky, and find a province capital that has your own name.